Most severe stock market declines (-20% or more) have occurred during economic recessions. For individuals in retirement it is especially critical to avoid recession driven market declines in order to effectively secure a stable retirement lifestyle. Recovering from these big losses can be a difficult and highly stressful endeavor. That is one very important reason why our financial advisory firm closely follow the natural rhythm of business cycle swings and stay on alert for the next major turning point in the economy. 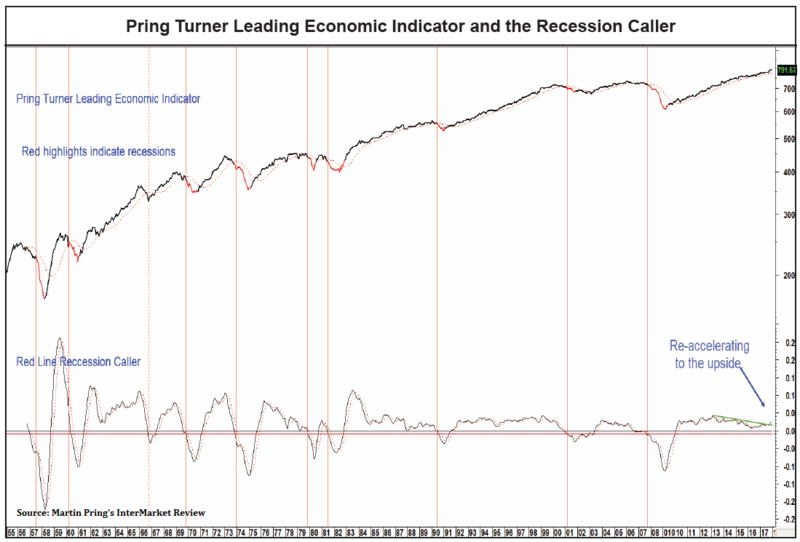 The Pring Turner Leading Economic Indicator featured above is a leading indicator for the economy designed to signal the onset of recession months in advance. What is this reliable forecast tool telling us now? The latest reading has pushed this leading economic indicator to new highs, and momentum is re-accelerating to the upside signaling low risk of recession in the months directly ahead. Continued economic strength should translate into higher stock prices. In other words, there is no recession in sight that would change our longer term optimistic view for stocks. The Big Blow-off Before the Big Blow-out? What Would It Take to Trigger a Secular Reversal in Bond Yields? When will Rising Rates Deliver a Knockout Blow to an Overvalued Stock Market?